As many of these sorts of discussions are these days, this forum was live-streamed. To the immediate right of the video, there was a window where viewers could simultaneously chat in real-time. 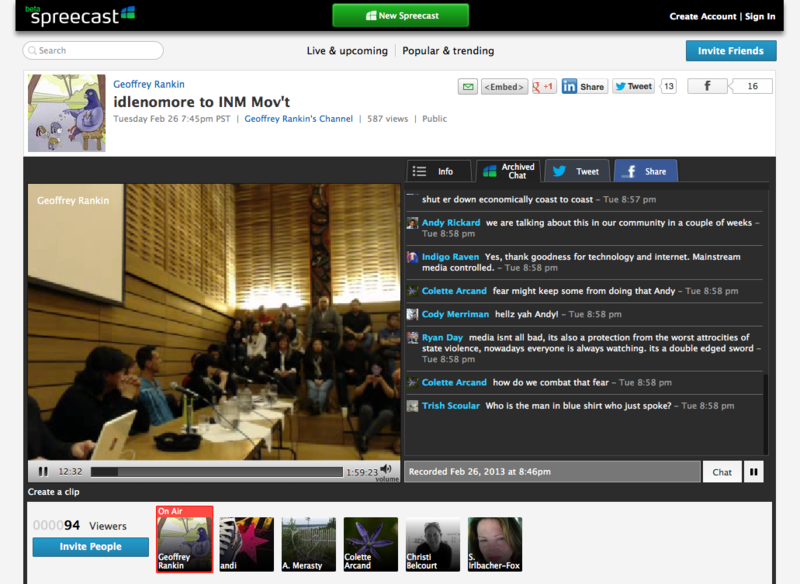 And, for a brief moment, that conversation addressed the utility of debate among those in the Idle No More movement. More specifically, it was suggested that we shouldn’t criticize our leaders or each other, that it’s disrespectful. I’m not sure how fully the point was addressed then but, to me, it’s worth exploring more in depth now, especially at this moment of transition (or transformation) for the movement. This concern over critiques seems to have emerged with growing anger directed at the Assembly of First Nations and National Chief Shawn Atleo for their perceived failure to effectively push-back against federal policy. Many have also criticized Chiefs and band councils generally, so much so that Chief Isadore Day of Serpent River began tweeting multiple times a day using the hash-tag #DividedNoMore (indeed a very good blog of the same name later emerged). And Atleo and his supporters echoed the calls for unity. The argument was that we’re all in this together and should direct our energies towards Canada, not each other. I thought then, and continue to think, that this anti-critique perspective is misguided. Indeed, I’ve written about the impossibility of unity among nations and the problematic nature of the AFN (and band council chiefs generally), so it’s no surprise that I feel we need to re-think (even replace) our institutions in order to do a better job at holding our leaders accountable. That means public debate and public criticism, and not just of the AFN or chiefs and councils. That disagreement exists at all, or that perspectives on goals and strategies vary, is a reality that requires exploration and inevitably leads to much needed debate and critique. Some of that work is already underway in the academic community. As Taiaiake Alfred and Jeff Corntassel write in “Being Indigenous: Contemporary Resurgences Against Colonialism,” there are “Aboriginal” and “Indigenous” people. The former pursue a legal relationship with Canada and couch their demands within the political and economic discourses of the state (since those legal, political and economic discourses are unlikely to change). The latter, Indigenous peoples are rooted in the land, bound together by spirituality and united in struggle against colonial psychosis. They act on the basis of rights and responsibilities that derive from sources independent of (and pre-existent to) Canadian institutions. More recently, Scott Richard Lyons addresses the same issue in his book, “X-Marks: Native Signatures of Assent,” although he distinguishes between Indigenous political groups as being either “traditionalists” or “modernists.” According to Lyons, conservatives aspire to decolonization via a “new society,” one rooted in real or imagined Native nations, while progressives reject this pure or essentialist view, and instead seek to navigate Canadian and American societies in hopes of finding a place that accommodates the unique nature of contemporary Indigenous identities. Without reducing the discussion to such terms, it is nonetheless important for us to acknowledge that there are significant political differences in Native politics (and within the Idle No More movement as well) with correspondingly divergent strategies for action. Where do we fall on questions about: whether to vote in Canadian elections; physical reclamation of land; patriarchy in our ceremonies; blockading road and rail lines; the role of allies; the importance of the Indian Act; resource development, and on and on and on? While these discussions go on within academic circles, they have not yet seemed to penetrate the Idle No More movement to any significant degree. This may be partly due to an unwillingness to critique or confront each other. Indeed, these debates can be difficult when we say things like economic development means ‘selling out,’ or that people who vote are ‘assimilated,’ or that the notion of an Indigenous nation is a ‘fairytale.’ These are heavy issues, after all, and there can be a tendency to be… unpleasant (though hopefully still respectful and constructive). So non-confrontation or abandoning the discussion when it gets too heated is the easier path to take, one many in fact take by citing the need for unity (and maybe the fear of hurt feelings as well). But the hard truth is that refraining from attempts to address and answer difficult questions in the quest to find solutions to challenging problems effectively endorses stasis. An even harder truth is that promoting and pursuing such artificial notions of unity and its corresponding implication of muted debate will ultimately mean the death of the movement. Hayden, what do you make of Ernie Crey’s comments concerning INM? “To get anywhere, you need to be tightly organized. You have to formulate a serious program. You need a strategy that you’re following, with a concrete agenda. And you have to be able to articulate real and achievable goals. You’ve got to be very suspicious of national visions, or visions of any kind.” How might they help spur discussion of the kind you seek?